Gee, I wonder what kind of creature could have made this entry in 1954 film. Warner Brothers' Phantom of the Rue Morgue (1954) is an odd mixture of faithful story adaptation, remake of the earlier fanciful Bela Lugosi film based on the same story, and horror-wannabe. The studio had just had a huge success with the Vincent Price-led House of Wax in garish colour and 3D the previous year and hoped to repeat it with the Edgar Allan Poe tale. The time of the story is updated to the latter 1800s but the Paris setting is kept (despite the film being shot entirely in Hollywood) and the basic crime of the story—the mysterious violent murder of a room's occupants—are retained. In this telling of the story, the initial chief suspect in the murders is Paul Dupin himself. (Yes, the C. Auguste Dupin of the story, renamed the more stereotypical Pierre in 1932, is now rechristened with the more Anglo-friendly Paul.) Dupin sets about investigating to exonerate himself at first and to save his love interest eventually. 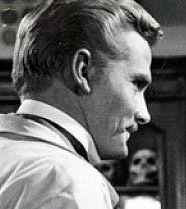 The two romantic leads are winningly played by low-profile Hollywood actors Steve Forrest and Patricia Medina. As the nominal protagonist, Forrest is appropriately handsome and personable, but like Ames in the earlier film he's overshadowed by the villain, the girl and the animal. Medina has scenes similar to those of Sidney Fox in the earlier film, fending off advances by both the doctor and his beast and at one point being carried into a tree, King Kong-style, by the latter. We get plenty of female screaming into the camera as befits a horror film. Much of this probably played out well in the state of 3D in 1954 and reports of anyone who's seen it in a 3D revival are positive. It's been shown on television a few times in 2D but it seems to be unavailable on DVD so far, which is too bad since, as a 1950s horror film, it's at least partially successful. It reminds me a little of the cheesier Hammer Studio horror films of the 1950s and 1960s. In any case, the plot careening wildly between Poe's story and Hollywood sensation, plus the lack of any real intellectual detective work, makes it another bust for fans of Poe's detective stories. A cinematic experience true to Poe's intentions was yet to come.